Everyone is obsessed with the gear we carry on the John Muir Trail. We’re fixated with the weight, the versatility and the expense. We worry about the comfort and durability. First time thru-hikers worry about forgetting something important. 1. Camp chair. Oh, and based on what I’ve seen on the trail, I should say “beach” chair. Don’t be the guy with one of these strapped to your pack. Even the contraptions out there that are basically a conglomeration of straps that turn your sleeping pad into a camp chair aren’t really necessary. Lean against a log or rock, just check beneath it first. Ssssssssssssss! 2. Multiple changes of clothes. I carry one extra set (socks, underwear, shirt and pants), which is more than many hikers do. I change clothes halfway to the place I plan my next rest day, and then wash everything when I arrive. Carrying more than one is probably not worth the weight. Choose your fabrics well and you can even wash and rinse them in your portable garment-washing-and-agitating-device (also known as a bear canister), and dry them quickly in the sun. 4. Almost anything cotton. 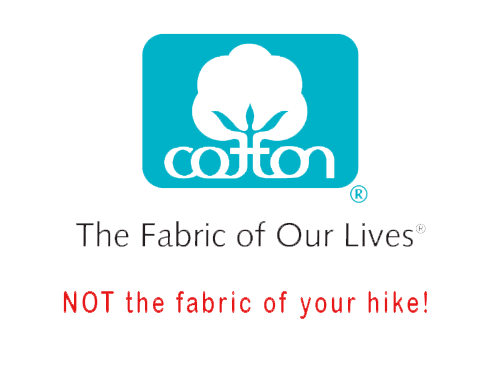 It may be the “Fabric of Our Lives”®, but it’s not the fabric of your hike. It retains moisture, does not provide warmth when wet, and takes forever to dry. If you insist on going with natural fabrics, wool is your friend. Otherwise, take advantage of the newest technological innovations in hiking attire. By the way, cotton pants, shirts, or underwear are bad; cotton socks are even worse. 5. A gun. First, I need to make something clear: what has two thumbs, a crooked smile, eats too much gelato, and loves the Second Amendment? THAT’S ME! Nevertheless, and putting all the legalities aside, neither the statistics nor the experience of thousands of hikers on this trail support packing heat. The bears are less interested in you than in your GORP, and if our cities were full of the kinds of wonderful people you’ll find on the trail, the home security business would collapse in a week. Special Bonus Item Not to Have on the Trail: a brand new pair of boots! Amen Brother! Add to portable music players, every other thing electronic (Kindle, iPad, even gps unless you plan on being way off trail), saving yourself the need to carry solar chargers or spare batteries and thus saving more weight. And that “garment-washing-and-agitating-device (also known as a bear canister)” also makes a great camp chair. Great point, Curt! Thanks for the comment. I love my Kindle on the trail! I have all my permits, instruction manuals for all the stuff I bring, a wilderness first aid book, the JMT guide book, tree identification stuff, etc., etc., etc. Thanks, Byron. I agree that some reading material can really be good to have on the trail. Thanks for the comment! Hike your own hike! It’s Capilene for me! I have yet to backpack with a tent. Always have a a small tarp for underneath, but in the nearly 10 years of backpacking, usually 4-6 day trips, only once have I had to use it for anything but sleeping on top of. If you have the skills to do it safely, hiking with a tarp instead of a tent is a great way to save weight. Thanks for the comment, Dan. Will do, and thanks for the kind words about the book. Ray, I love your posts mate! The gun really made me laugh! Thanks, Ian! Years ago, when I was planning my first JMT hike, the number one question I was asked by non-hiking friends was, “Are you going to carry a gun?” I think many (unschooled) people see the Sierra as full of large animals waiting for supper to come around the corner. One slight change to #4… I always bring several cotton bandanas. I love that they stay wet.. I dip one in every stream I cross and tie it around my neck to cool me off. Great for drying dishes, drying yourself, pee towels, etc. Multiple use items and only 1 oz regardless of the color! Don’t leave home without at least one! Terrific recommendation, Kelly. Thanks for making that point! +1 on the bandana! It’s easily the fastest drying thing I carry too. Years ago I went backpacking with a guy who was afraid to be outdoors, so he brought a gun. We were sleeping outside, and in the middle of the second night, he mistook me for a bear, and almost shot me. I heard the story the next morning. There are certainly beasts with attitudes and appetites in Alaska, but death-by-wildlife in the contiguous United States is pretty rare. What you describe is probably more likely than being attacked by wildlife. Thanks for the comment, Chris. Hey Ray, I leave in five days and your book/blog have been a huge help. Have you done a post already about little-known useful items that people should definitely bring if they can afford the weight? We have a large group and can afford to disperse more gear. Thanks, Alyssa. I’m not sure I have addressed that point, directly, but here are some extras worth taking: reading material to wind down in the tent at night, more (or better) photography gear, treats for around the campsite at night, ukulele (if you know how to play it), and a set of socks to be used only to keep your feet warm in your tent. Good luck! Ukulele! That’s exactly what I was thinking!! I have guitars, a uke, and a mandolin lying around the house, and I was trying to figure out how to do without my iPod without overburdening myself on the trail. The ukulele came right to mind, and as it happens I do know a song or two…or at least I used to. (-8 Thanks, Ray, for your ever-useful advice for making this hike a joy as well as an adventure. Can’t wait until I can make the trip out there myself. ALOHA!